(Ambroise Vollard [1867-1939], Paris). Edward Steichen [1879-1973] purchased 1912 for Eugene [1875-1959] and Agnes Ernst Meyer [1887-1970], Mount Kisco, New York, and Washington, D.C.; gift 1959 to NGA. For Steichen's role, see letter dated 12 July 1977 from Katherine Graham in NGA curatorial files; lent by the Meyers to the 1921 Metropolitan Museum of Art exhibition. Loan Exhibition of Impressionist and Post-Impressionist Paintings, The Metropolitan Museum of Art, New York, 1921, no. 17, as Still Life - Peaches. Cézanne Picasso Braque: Der Beginn des kubistischen Stillebens", Kunstmuseum Basel, 1998, no. 1, repro. 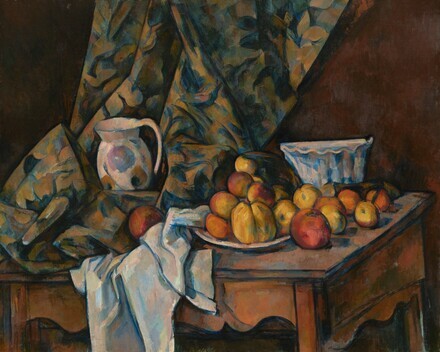 Cézanne and American Modernism, Montclair Art Museum; The Baltimore Museum of Art; Phoenix Art Museum, 2009-2010, no. 21, repro. (shown only in Montclair and Baltimore). Impressionist and Post-Impressionist Masterpieces from the National Gallery of Art, The Museum of Fine Arts, Houston; The National Art Center, Tokyo; Kyoto Municipal Museum of Art, 2011, no. 12, repro. Bulletin of The Metropolitan Museum of Art (1923): 263. Summary Catalogue of European Paintings and Sculpture. National Gallery of Art, Washington, 1965: 25. European Paintings and Sculpture, Illustrations. National Gallery of Art, Washington, 1968: 18, repro. European Paintings: An Illustrated Summary Catalogue. National Gallery of Art, Washington, 1975: 60, repro. Walker, John. National Gallery of Art, Washington. Rev. ed. New York, 1984: 499, no. 737, color repro. European Paintings: An Illustrated Catalogue. National Gallery of Art, Washington, 1985: 79, repro. Kopper, Philip. America's National Gallery of Art: A Gift to the Nation. New York, 1991: 165, color repro. Rewald, John. The Paintings of Paul Cézanne: a catalogue raisonné. 2 vols. New York, 1996:no. 936, repro. Kelder, Diane. The Great Book of French Impressionism, 1997, no. 367, repro. Hand, John Oliver. National Gallery of Art: Master Paintings from the Collection. Washington and New York, 2004: 391, no. 326, color repro.